The Cinnaminson National Bank Of Riverton in New Jersey printed $311,350 dollars worth of national currency. That is a pretty standard output. However, some types of currency from this bank could still be rare. This national bank opened in 1906 and stopped printing money in 1925, which equals a 20 year printing period. That is a fairly normal lifespan for a national bank. During its life, The Cinnaminson National Bank Of Riverton issued 4 different types and denominations of national currency. We have examples of the types listed below. Your bank note should look similar. Just the bank name will be different. For the record, The Cinnaminson National Bank Of Riverton was located in Burlington County. It was assigned charter number 8484. The Cinnaminson National Bank Of Riverton in New Jersey issued 340 sheets of $10 1902 red seal national bank notes. All red seals are very rare. But that sheet output is extremely low. We would love to see a picture of what you have. 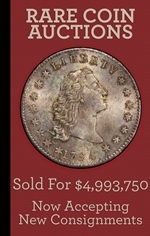 Collectors love ten dollar 1902 red seals. They usually represent the rarest bank notes printed by any national bank. Don’t let the term “series of 1902” confuse you. These were actually printed for about six years between 1902 and 1908. That is obviously a very short issue period which means that many red seals are quite rare. Each note has a portrait of William McKinley. Be sure to check the number under McKinley. If it is #1 then you are dealing with a note from the first sheet of bank notes issued. Number one bank notes are worth even more money than the already rare red seals. The Cinnaminson National Bank Of Riverton printed 340 sheets of $20 1902 red seal national bank notes. Twenty dollar red seal bank notes have poor survival rates. They don’t command premiums compared to the ten dollar denomination, but they are definitely rarer. All 1902 red seals were printed on four note sheets. There were three ten dollar bills and one twenty dollar bill per sheet. The 1902 $20 notes have a portrait of Hugh McCulloch on them. The charter number and seal are both printed in red ink. The serial numbers have a slight blue tint to them. 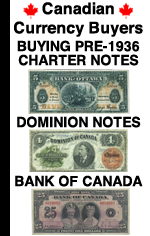 The charter number is printed around the border of the note several times. The bank’s title is right in the middle of the note and the state of issue is printed just below the title. 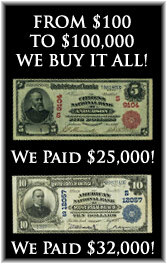 Remember that all national bank notes are valued based on their condition and rarity. 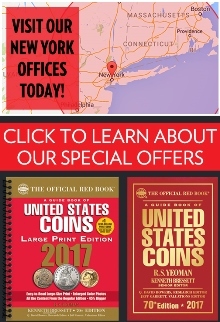 The same rule applies to 1902 $20 red seals. The Cinnaminson National Bank Of Riverton also printed 5,887 sheets of $10 1902 blue seal national bank notes. That is a fairly standard sheet output for a national bank issuing blue seals. You likely aren’t dealing with a super common or a super rare bank note. 1902 $10 blue seal bank notes all have a portrait of William McKinley on them. Values can range from as little as $40 up to over $10,000. There really is no trick to know what is rare and what is common by just doing an internet search. You really need to work with an expert (like us) in order to determine the value of your specific bank note. There are at least ten different factors than can make some 1902 $10 blue seals worth more than others. We know exactly what to look for and we would be happy to provide a free appraisal and our best offer. The Cinnaminson National Bank Of Riverton also printed 5,887 sheets of $20 1902 blue seal national bank notes. The same rarity rules for 1902 $10 blue seals also apply to $20 blue seals. Just remember that $20 bills are by nature three times rarer (unfortunately they don’t command a premium over other denominations). Hugh McCulloch is pictured on the front of each bill. Contact us if you need pricing help.